Early today we had out unboxing of WizKids‘ upcoming Marvel Heroclix X-Men: Xavier’s School Fast Forces and Dice & Token packs. Below you’ll find some up close images of what you’ll get in the set. The new Fast Forces set allows you to field the original X-Men Cyclops, Beast, Jean Grey, and Iceman as either X-Men or X-Factor and also includes Rusty and Skids. You can check out up close photos of the figures and cards below. Celebrate the release of Marvel HeroClix: X-Men Xavier’s School with an all-new Fast Forces Set and Dice & Token Set! WizKids has released a first look at WizKids‘ Dice Masters set, Marvel Dice Masters: X-Men First Class. This September, the set brings more mutants to the tabletop for Dice Masters action. The 124-card expansion features multiple rosters of X-Men, the Exiles, and the Brotherhood of Mutants. Awaken – lets you damage your opponent, reroll opposing characters, or get an attack boost by spinning up to a higher level. Professor X: Peaceful Coexistence allows players to spin all X-Men-affiliated dice up one level at the start of their turn. Cyclops and Iceman both have the Awaken keyword. Cyclops: Boy Scout may deal three damage to a target character when his character die is spun up, while Iceman: Cold Hands, Warm Heart doubles his attack value. Thunderbird: Warrior of the Apache will allow you to spin up all your characters when he’s KO’d. If Sunfire: Moeagaru! is also on your team, his Awaken ability will activate giving him +1A and +1D. Storm: Misspent Youth allows a player to prep a die from their bag whenever a Storm die spins up a level. Infiltrate – lets you deal direct damage with “while active” abilities. Magneto: The House of M grants all Brotherhood characters the keyword. Blob: Appetite for Destruction has the ability to prevent an opponent from both purchasing and fielding dice from a chosen card, and Scarlet Witch: Careful What You Wish For can force an opponent to twice roll an Action face before they can use it. But Infiltrate isn’t just for the Brotherhood, the Exiles have it too. Blink: Unhinged from Reality gains Infiltrate whenever a player uses an Action die. Mimic: Borrowed Talent allows a player to copy the A and D of a character and Prep two dice anytime that character is fielded, while Morph: Change of Heart can use the effects of a Basic Action Card while attacking. The set also sees the debut of Thunderbird, Sunfire, Banshee, Doop, Onslaught, Boom Boom, Jubilee, and more! A new set for Dice Masters has appeared on WizKids‘ solicits page. June sees a brand new Marvel set, Marvel Dice Masters: X-Men First Class. The set is just listed as a gravity feed plus the bonus cards that go with it. That’s the second set focused on the X-Men, the first being Marvel Dice Masters: Uncanny X-Men. Recently Marvel Dice Masters: Deadpool was released which featured X characters. 2017 sees the continuation of primarily gravity feed releases which consists of foil packs that feature 2 cards and 2 dice. 2017 has solicited two starter sets, one team pack, one box set, and 3 gravity feeds in the first six months. So far for 2017 we will see Marvel Dice Masters: Iron Man and War Machine Starter set in February, Teenage Mutant Ninja Turtles Dice Masters: Heroes in a Half Shell Box Set in February, DC Comics Dice Masters: Batman gravity feed in February, Marvel Dice Masters: Defenders Team Pack in March, Marvel Dice Masters: Guardians of the Galaxy in February, DC Comics Dice Masters: Superman and Wonder Woman Starter set in May. Steve Jackson Games and USAopoly have teamed-up for a brand new edition of Munchkin featuring the X-Men! It’s the game every mutant has been waiting for! Join the X-Men on a thrilling adventure to defend mankind from renegade mutants. MUNCHKIN: X-Men Edition combines Marvel’s beloved collection of X-Men comics with the role-playing fun of Munchkin. Players take on the role of students attending Xavier’s School for Gifted Youngsters and team up with Professor X, Wolverine, and more super-charged mutants to take down the likes of Sabretooth, Juggernaut, and the almighty Magneto. The game will include 128 Door and Treasure cards, four player Role cards, four level trackers, game rules, and a custom die. The game will be out March 2017. The company also publishes Munchkin: Marvel Edition and its two expansions, Munchkin Marvel 2: Mystic Mayhem and Munchkin Marvel 3: Cosmic Chaos and also has Munchkin Zombies: The Walking Dead. There are also Munchkin comics published by BOOM! Studios. I’m super excited for Knight Model‘s upcoming Marvel Universe Miniature Game which will allow us to pit some of Marvel’s most popular characters against each other on the tabletop. We’ve know what would be a part of the first release for some time, but Knight Models has now released a better look at what comes in the first starter sets. Knight Models has released new images with a better look at the miniatures, the rulebook and how the characters cards will be packed (the same as their Batman Miniature Game). We’ve been covering the lead up, but Knight Models has officially launched it’s latest game, Marvel Universe Miniature Game. The game allows you to play as Avengers, Guardians of the Galaxy, and the X-Men, pitting the factions against each other. There are three starter sets which include 4 metal miniatures as well as a mini rulebook. The price for the starter sets will retail for roughly $50 in US dollars but are currently on sale for about $45. What is new is the blister packs launching along with the game, along with a template and markers. The blisters retail for $22.50 and the launch figures are Black Panther, Deadpool, and Nova. Definitely not ones I was expecting. There is also a marker set for each faction. Check out the images below and you can order them directly from Knight Models. Knight Models has released more details on their upcoming Marvel Universe Miniature Game. The miniature game will feature factions and alignments. Factions include Superhuman, Mutant, and Cosmic with the Avengers, X-Men, and Guardians of the Galaxy representing each to start. There will also be alignments such as Hero, Villain, and Neutral. Forces will be put together based on Levels with games being played at 30-50 and that will be decided by either the scenario being played or the players themselves. You then choose characters whose Faction and Alignment match, with Neutral characters being able to be used by Heroes or Villains. You are also limited as to the characters themselves. You can’t have two Steve Rogers for example, but you could have two Captain America characters if one was Sam Wilson and the other was Steve Rogers. Also revealed is that while the game will launch with three starter sets, Avengers, X-Men, and Guardians of the Galaxy, there will also be another character released in blister for each faction. Each starter set also includes character cards and a small-sized rulebook. Knight Models has also shown off the X-Men faction with Rogue, Cyclops, Wolverine, and Colossus, each in a more classic design. 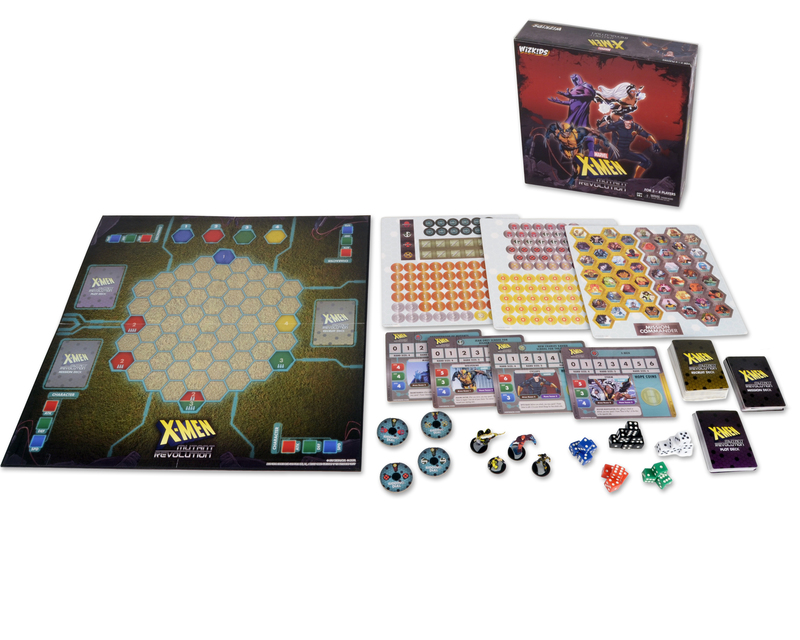 WizKids and Gale Force Nine have released the new HeroClix strategy game X-Men: Mutant Revolution , in North American retail this week.